My husband and I are outside quite a bit building and working on different projects now that the weather is nice, and it’s wonderful! The kids will play outside in the yard while we’re working, and one of the things they love to play with are all the wood scraps that we seem to have an endless supply of. This past Saturday they were stacking the scraps, building towers, making roads, pretending all sorts of things, and even coloring them with their sidewalk chalk. It kept them busy for a long time, and they were having a ball. 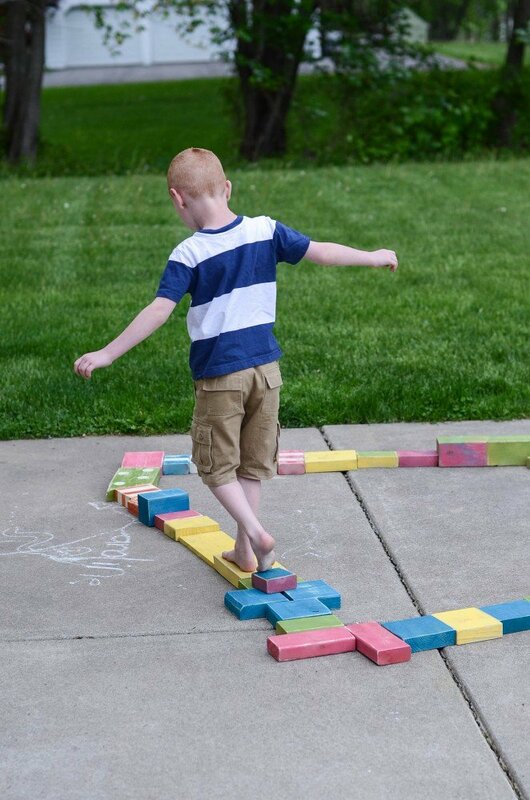 I decided to use all of our scrap wood and make them their own permanent set of outdoor wooden blocks to keep outside all the time, knowing they would be a huge hit this summer. We LOVE them! I’m telling you, this is seriously the EASIEST project ever! I made them in an afternoon, plus a little drying time, and because I used scrap wood and all my leftover spray paint, it was totally FREE. Hello!!! Love love that! If you don’t have scrap wood laying around, don’t worry–wood is really cheap to buy. You can get a 2x4x8 for around $2-$2.50–just the regular pine will do. The Home Depot usually has an area with cheaper wood that you can pick through, and it would cost you even less. It’s so fun to have a set of blocks that’s just for the outdoors, and it’s something I don’t worry about getting ruined. I’m keeping them in a large tub that goes in the garage, and they can play with them anytime they’re outside. I used all different sizes and widths of wood–4×4 posts, 2×4’s, 2×6’s, 1×8’s–whatever we had. They were already different lengths, but some of the longer and larger pieces I cut down. I left them all different sizes, because it gives them more variety and options when they’re building. When I painted, I went for the whimsical look, rather than perfection, like I usually do. The stripes aren’t perfect, or exactly aligned, and I altered all of them to be a little different. That’s the beauty of this project–it’s charm is in the imperfection! Here’s how to make your own set of outdoor wooden blocks! 1. Cut your wood down to desired lengths, if necessary. 2. You can either sand now, or sand after you paint. I always sand after I paint, because I like the distressed look. :) My husband made fun of me for distressing these blocks, but they’re so cute, and I pretty much distress any piece of wood that comes into my hands! You don’t have to though–you can sand first, then paint and leave them more solid-looking. You really need to sand well, paying close attention to the edges and corners. We don’t want little hands to get splinters! 3. If you choose to sand first, wipe all the excess dust off. Lay out a large tarp or drop cloth and spray all of your blocks. I used a bunch of different colors–whatever I had sitting on the shelf. You can choose whatever you like! Let dry completely. 4. I painted some of the blocks white first, because I decided to do a few with stripes and polka dots. I couldn’t resist! I used painters tape for stripes and vinyl circles for polka dots, and applied them on top of the white dried paint. I sprayed them the second color, and let dry completely, then removed the tape and dots. You could also have your kids paint their own blocks with acrylic paint, and put whatever designs they want on there! 5. If you didn’t sand before painting, do it now! Wipe off all of the excess dust. That’s it!!! LOVE LOVE LOVE!! I have another whole stack to paint this week, and I’m going to add numbers and the alphabet. 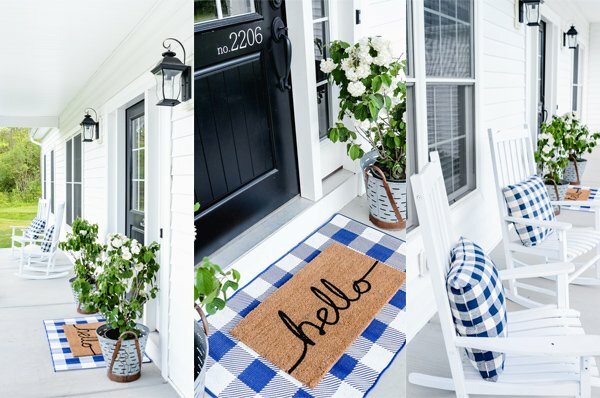 You can stencil them however you like, or not at all–it’s really just how much time you want to spend, and what you think your kids will like. You can totally spray them and be done to0, and they will be just as fun! Last month I decided to make garden furniture myself and I used pallets. I must say that I am so proud of this project. However, there are a lot of leftovers from the pallets and I will paint them in fresh colors for my three-year-old daughter because she loves playing with blocks. Thank you a lot for the idea! Such a clever idea! We made these today, grandpa sawed the wood and my 2.5 year old painted them with washable tempura paint and foam brushes. It was a fun family project! Brilliant idea, it will be so much fun for my kids. Last year i made some vases for plants from cans, just covered them in some more colors and the my daughter really enjoyed her time watering and growing her own seeds. Thanks, Kathie! And that sounds so fun!–great idea!